The Dubai Intl. Airport is continuously developing and currently has 2 terminals and accommodates 100 airlines, which connect to over 140 destinations. 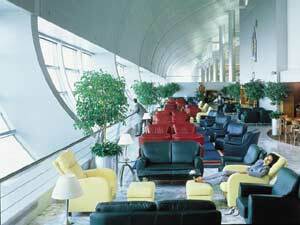 The airport has a meet-and-greet assistance service known as Marhaba Services [(4) 224 5780]. Transportation from the airport is possible by taxi, bus, car rental, and limousine. 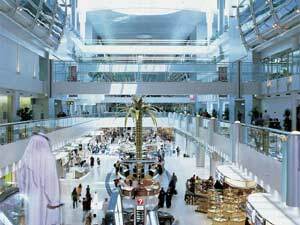 The taxi service is provided by the government-run Dubai Transport airport taxi service, where each cab is meter-run. Airport taxis are meter cabs with a pick-up charge of Dhs. 20 ($ 5.50) and the final fare will be calculated according to the recorded distance travelled. The Dubai Municipality public bus system costs Dhs. 3 per person and travels on bus routes 401 and 402 to either the Al Sabkha or Al Ghubaiba bus stations, passing by, or near, many of the hotels and apartments found in Dubai. There are 15 car rental companies with offices at the airport, and the majority of them provide chauffeur services. Limousine services are present at the Dubai airport through Siji Limousines and Dubai VIP Limousine Service. Terminal 1 houses the Dubai International Hotel, which is a five star hotel with 88 rooms, restaurants, G-Force health club, swimming pool, and a business and conference facilities. The hotel occupies the last 2 levels of the Shaikh Rashid Terminal and the hotel prices are per hour starting from around Dhs. 100 ($ 27). There are three hotels within 1 km (0.62 miles) of the airport, which are the Millennium Airport Hotel, Al Bustan Rotana Hotel and Le Meridien Hotel. Other hotels can be reached by bus or car and take between 5 to 15 minutes to reach. The second stage of the airport expansion program began at the beginning of 2002, and is expected to be completely finished by 2006. This program includes the development of terminal 3, concourse 2, concourse 3, a mega cargo terminal, flower center, and an apron area. The new terminal and concourses will be dedicated to Emirates Airlines flights. Additional information on the airport’s development can be found here.